"Menopause" is often a catchall phrase used to refer to a wide time period of transition. In reality, there are multiple stages of menopause: premenopause, perimenopause, menopause, and postmenopause. Perimenopause, the first stage of the menopause transition, is the stage most commonly associated with menopause, due to its variety of different symptoms and its status as marking the beginning of the transition. This stage can last anywhere from 2 to 10 years, depending on the woman. Premenopause is the time after puberty, but before the menopause transition. Premenopause lasts from the ages of 12 or 13 to between 40 or 45. Menopause is the moment a woman stops menstruating. This is 12 months after your last period. This can occur any time between the ages of 50 and 55. It is impossible to get pregnant after this time. Perimenopause ends when menopause arrives. This is when periods have permanently stopped, and you have become infertile. It is usually considered a year after your last period, however, for some women it can be up to two year. 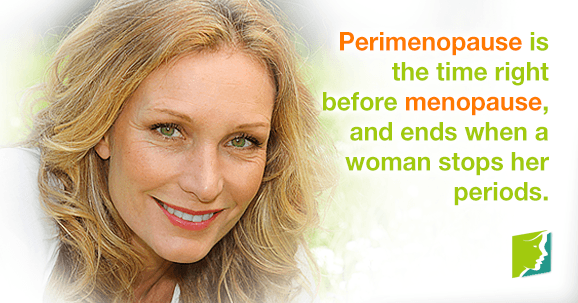 In total, perimenopause can last between two and ten years, depending on the individual. Many menopausal symptoms also end when your periods do, which can be another indicator that perimenopause is over. However, some symptoms, such as hot flashes, can continue into postmenopause, and well into old age. If you are ever concerned about any aspect of your menopause transition, talk to your doctor. Read more information on various perimenopause symptom treatment.